Kerala MVD - Let us see some details about Kerala MVD website and learn how to search a vehicle using registration number or chassis number in Kerala RTO website. Kerala MVD stands for Kerala Motor Vehicle Department. Kerala Motor Vehicles Department was established by the Government of Kerala. We might need to know the Kerala MVD vehicle owner details in a number of occasions like knowing the previous vehicle owner details who owned the vehicle before you buy. RTO Kerala has a very helpful website to let you know the vehicle owner details which you need to know. You can apply for various services like duplicate RC, Change of address in RC, transfer of ownership online in the portal. You can also view the application status in the same portal. How to find RTO Kerala MVD vehicle owner details using registration number in Kerala MVD search? Scroll down a little bit and Check for 'Information Services' in the right sidebar. 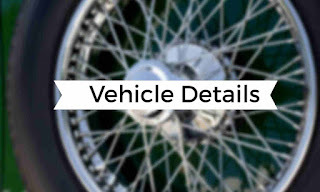 Click on 'Vehicles Details' under the Information services menu to search for vehicle details. You can search with either registration number or chassis number. 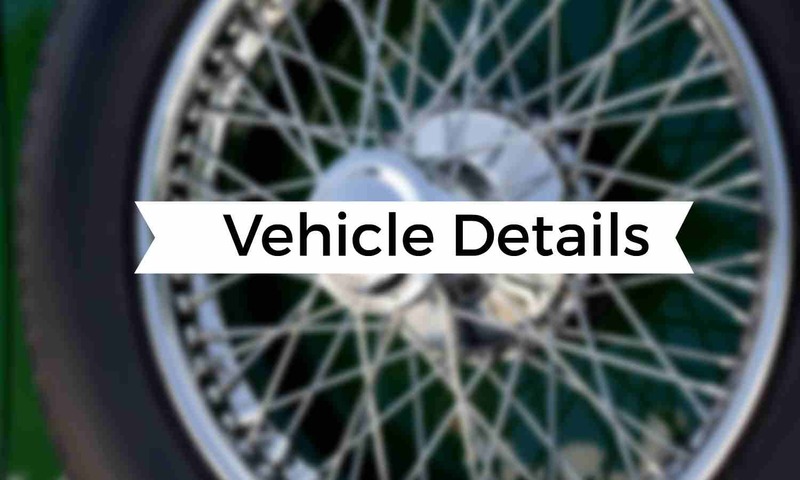 One of the numbers is mandatory to search the vehicle details. Enter registration number or Chassis Number whichever you know. If the registration number is KL 01 AA 0001, type KL-01-AA-0001 in the registration number box. If you know the Chassis number, enter the last 5 digits of chassis number. Enter any one of the input values to get the results. Enter the captcha. You have to enter the characters shown in the box. 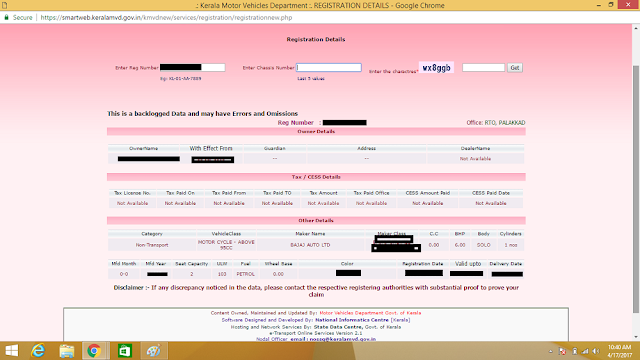 Click on 'Get' button to get the Kerala MVD vehicle owner detail. If you have entered correct vehicle registration number or chassis number that is registered in the Kerala MVD and correct characters shown in the image, you will get the complete vehicle details as shown in the picture below. What are the vehicle details you can see in the search result? If you do not get the expected results, there might be following problems. If you have not entered the characters shown in the image correctly, you will get the following error message. What if I enter wrong vehicle registration number? You will get the below message. The RC of the vehicle is not issued by authority... Please Contact Your Concerned RT0 !!!! What if I enter wrong chassis number? What if I enter a vehicle registration number or chassis number that is not registered with Kerala RTO? How to use the below table for Kerala Vehicle Number Search? If a vehicle has the number as KL 01 AA 0001, it means that it is registered in Thirvananthapuram city RTO in Kerala state. AA denotes series. 0001 denotes the serial number. If a vehicle has the number as KL 02 AA 0001, it means that it is registered in Kollam city RTO in Kerala state. AA denotes series. 0001 denotes the running serial number. If a vehicle has the number as KL 41 AA 0001, it means that it is registered in Aluva RTO in Ernakulam District in Kerala state. AA denotes series. 0001 denotes the running serial number. Below is the table of Kerala Motor Vehicle Registration details. The first column is the serial number. The second column is the State and RTO series number details. KL stands for Kerala State number. That is a vehicle which starts with KL in its registration number, it denotes that the vehicle is registered with Kerala RTO and it means that the particular vehicle is registered in Kerala State. The format is same for all vehicle numbers registered in Kerala RTO offices. Only the RTO code and serial number vary. For Vehicle Registration forms, please check the Kerala Motor Vehicle Department website link - http://keralamvd.gov.in/index.php/forms/vehicles-registration. There are different forms available for new registration number, reservation of registration number, renewal of registration certificate, duplicate registration certificate, No objection certificate, Transfer of Ownership of Vehicle, Transfer of Ownership of Vehicle (After death of Registered Owner), Transfer of Ownership of Vehicle (Owned in public auction), Change of Address in Registration Certificate, Endorsement of hypothecation, Termination of hypothecation, Fresh R.C. In the name of Financier, Fresh certificate of Fitness (for transport vehicles), Renewal of certificate of fitness (for transport vehicles) and few other forms available in the Kerala Motor Vehicle Department website. All the fees and taxes that have to be paid at Kerala Motor Vehicles check post can be now remitted online too using etreasury.kerala.gov.in website. You can now apply online for the following services in Kerala MVD website. Have a look at the below video to learn how to use KERALA MVD to get vehicle owner details. Hope you find the information provides in this article 'Kerala MVD Vehicle Details - RTO Kerala Motor Vehicle Department Registration Details Search' is useful for your to find out the Kerala vehicle owner details.